DizzySE or Dizzy Scripting Engine - is the environment for the development of Dizzy-like games for the home computer ZX Spectrum 128 and its clones. A key feature of DizzySE is to rid the developer of programming on assembler language and knowledge of computer architecture. Everyone can make their own Dizzy. It is only necessary to learn a very simple scripting language and to know any graphic editor capable of working with images with indexed color. 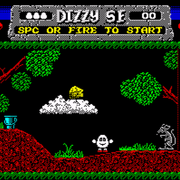 DizzySE engine provides almost all situations that occurred in the classic Dizzy serie. Those situations that are not provided for in the engine can be implemented using scripts. As a map editor for DizzySE, the familiar to many, time-tested and well-proven editor DizzyAGE was used. The engine is actively developing. Future plans: adding new features and functions both for the engine itself and for the IDE. Here you can download DizzySE itself and its detailed documentation (Sorry, documentation is only in Russian yet), as well as various additional resources, games, etc. This all looks really interesting. I will mention this engine when I work on the news round-up article for Yolkfolk. In the meantime, I've added your site to the Links page. The physics of the jump were significantly reworked. Dizzy now does not catch the back of the head with rough surfaces, but slides along them. Removed as unnecessary animation STUN. Instead, it is now the animation DEATH. Previously, this animation was assembled by the engine from IDLE and JUMP FRONT animations. May be useful for games where the main character is not Dizzy. 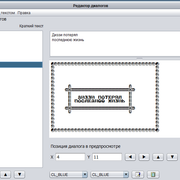 Added new event EVT_ANIMATION_END. The script for this event is called at the time of completion of the animation at the target object. To activate this event, you need to write to the EVT_ANIMATION_END ID of the desired object. Naturally, he should have an animation set up and a script set. A new version of the NEDORES utility has been used. In the old version, a bug was found in which, with some combination of colors, an incorrect brightness of familiarity was established. 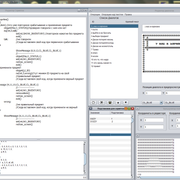 IDE monitors the number of open copies of DizzyAGE and does not allow to open more than one. Earlier Tileset settings for the NEDORES utility were stored in DizzySE / tools / Tileset.txt. Now for each tileset it creates its own file with settings and the name of the tileset (number) .txt. This can be useful if you plan to use a non-black background in the game. DizzyAGE uses a transparent color to determine the permeability of brushes. those. if you take a transparent color on an inclined surface and do not specify a transparent color in tga, then in the cutter tile, which is output from DizzyAge, in place of this brush will be not a ladder but a rectangular area. When any background graphics hit this area, there will be glitches of physics. Earlier in the IDE transparent color was clearly indicated - black. Now the left-upper pixel in the 2nd tile is responsible for the transparent color. It is very necessary when the background in the game is not black. I have installed this tool, it works great. 1. Does it handle memory above 64k? I am using a ZX Spectrum 128k machine and I want to know if I can use all memory, or I need to create several levels for all data over 64k. 2. I've found a strange behavior in the template game that is created with a new project. If I open the map with DizzyAge and just move one of the existing tiles or change the property from air to solid or something else, the compiled game will not run anymore. Just freezes at start screen. Is this a bug, or I am doing something wrong? If I add new tiles this does not happen. 3. Do you plan to translate the documentation? Also more examples are welcome. 1)DizzySE uses all memory of 128kb machines. It's about 35-45 rooms depending on detail. The rest of the memory is allocated to other resources (music, sounds, sprites ..) and the engine. If you want to make a game with a larger map, you will have to split it into several levels. 3)The documentation is almost completely translated to English. In late April - mid-May, we will release a new version of the engine with a large number of updates. Documentation will be ready for this period. Hi, I've attached here the project. I've just created a new project, opened the map and moved some of the leaves from the left a little. Saved the map and compiled the game. I am using Spectaculator 8.0 as emulator. Did not try it on the real computer yet. You accidentally created several objects with tileset N 0. DizzySE operates only with his own tilesets: 511,512,513. Just put this updated script to TOOLS folder into your DizzySE installation folder. It ignores all objects drawn by tilesets with non-DizzySE IDs.